Many seniors enjoy a salty snack from time to time, but too much sodium in the diet can have a negative impact on the heart, brain, kidneys, and more. This makes it important to watch what your senior loved one eats to help prevent these problems from developing. 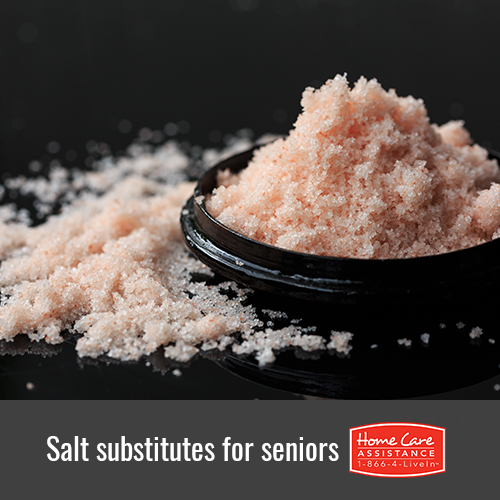 Luckily, there are plenty of things that can replace salt in your loved one’s diet, and the Harrisburg in-home care experts at Home Care Assistance have put together a list of some healthier options. Your loved one may be familiar with the taste of cardamom in the form of tea or chai. This spice is also often used in combination with ginger, cumin, or coriander seeds in Indian cuisine. Cardamom is suitable for a variety of sweet and savory foods, from curries to rice pudding, and is known to promote gastrointestinal and cardiovascular health, lower cholesterol, and increase blood circulation. This aromatic herb is a favorite in Italian, Thai, and Indian cuisine. Used in either its fresh or dried form, basil adds a slightly sweet taste and pungent aroma. It also has anti-inflammatory properties that can reduce the symptoms of arthritis and inflammatory bowel disease. Basil is also effective in killing off free radicals that can damage your loved one’s heart, liver, and brain. Cayenne is derived from red chili peppers and is often used in Mexican, Spanish, and Indian dishes. Even a tiny bit of cayenne can add a spicy punch to foods like soup to meatloaf. This spice is used widely as a digestive aid and to relieve gas. Peppers also contain capsaicin, which can alleviate inflammation and chronic muscle and nerve pain. A squeeze of fresh lemon juice can make almost any dish seem refreshing and light. Your loved one can use lemon juice as part of a marinade for chicken or fish or over fresh fruit for dessert. People who include a lot of citrus in their diet have a lower risk of stroke and lower levels of free radicals known to cause cancer. Garlic, whether fresh or powdered, is a natural flavor enhancer for almost any type of savory dish. In addition to its wonderful taste and aroma, garlic has numerous medicinal qualities. The antioxidants in garlic can help prevent Alzheimer’s and other types of dementia, and it is also useful in lowering blood pressure and cholesterol. To learn more about how maintaining a low-sodium diet can promote your loved one’s health, reach out to Home Care Assistance. Our caregivers can help your loved one prepare nutritious meals and even go grocery shopping for the foods he or she needs. For seniors who require more extensive assistance, we also offer specialized Alzheimer’s, Parkinson’s, and stroke care Harrisburg families trust. For more information on our senior care services, call one of our knowledgeable Care Managers at (717) 540-4663 to schedule a complimentary consultation.